I just installed for the first time Immunet on win 10, everything seems working fine, except the following. 1) There is no option for submitting files (I have unchecked it during installation, but it is not in settings). 2) Also, history finds no data, just like in win 7 installation (all these are with the last version). 3) And a question, I see a lot of file extensions excluded (in win 10). Is it ok? 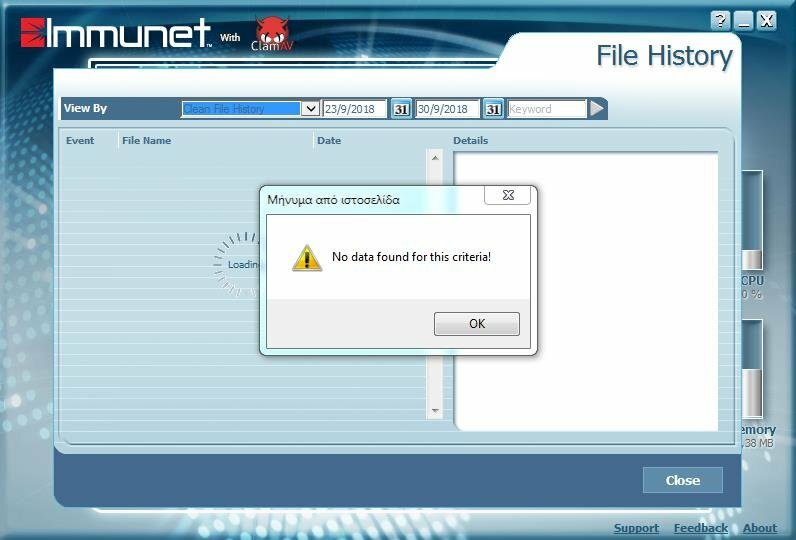 submitting files, via false positives you can do via the immunet website. Unless you mean to submit files to be scanned. Then do a custom scan, and select what you want. As far as the history, which tab is having issues? Default, clean file history? Quarantined file history ? Scan history, file events? block process history? The file extensions excluded you can remove them if you wish, especially if you use other anti-viruses WITH immunet. ok. My fault! Well, there was an option in settings to let submit suspicious files automatic. Now, it's gone, and it has this option during installation! Fine? Also, all tabs have problem just like the pic you can see, except "all file events" which has only a flash scan!!! And for file extension it is my question why the default exclusions are all these, if it runs smoothly with these why should i remove them? Did you run scans on those days ? There is a definite bug with the newest build having issues creating and/or accessing the .db history files. I'm seeing basically the same thing too. Can someone enable 'debugging' and send me a support log after a scan so I can look into the .db history files.